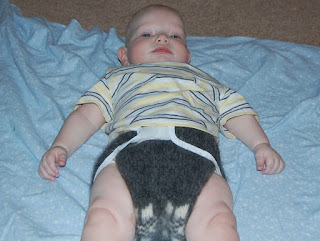 You could test your baby's used wool covers by dribbling some water on them. If the water beads up, they are still good. If the water spreads out or soaks in, you need to re-lanolize them. To do this, you need to get some Lanolin, (you don't have to pay the $$ for Lansinoh). Dissolve a small amount in a cup of hot water, then fill a sink full of warm water. Pour the water and dissolved Lanolin into it, then put the covers in. Squeeze the covers to get the Lanolin to penetrate. Then squeeze the water out, and lay flat to dry. You might also want to put a bit of baby shampoo in the water, to clean them. I am not a lanolizing expert, so I am not sure if the shampoo would have any effect on the lanolin being effective.... anyone else knows? If you did this, you would want to rinse them in some clear water first. Another option: I use Eucalan, which is a special wool wash which already has lanolin in it. You can add additional Lanolin, which I recommend for the first wash since they are gently used. Then every so often, maybe every month or two. Thanks to Scarlet for this frugal baby tip!